In less than 48 hours, I conquered that small, forgotten space – that room within the bathroom. A toilet room that was once a dungeon and wasted space has been made over not just in appearance, but also functionality. 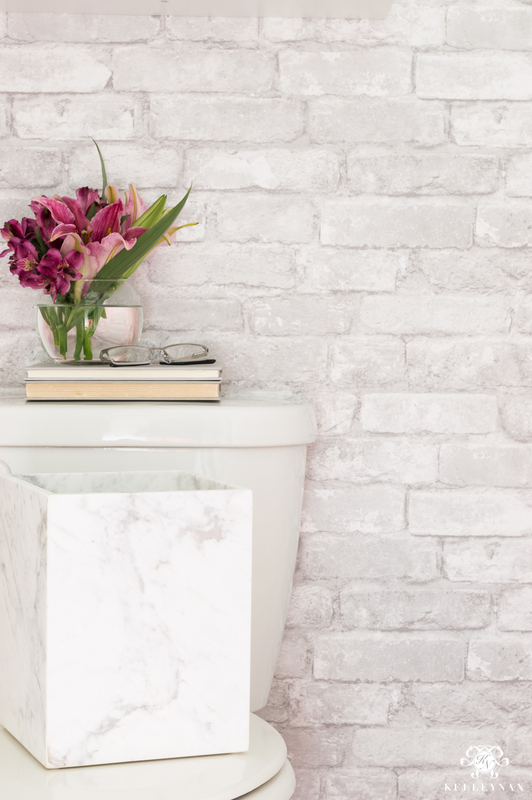 Read on for the full toilet room makeover reveal and clever bathroom storage. This post is in partnership with Bed Bath & Beyond. As always, concept and all content are my own. Post may contain affiliate links. For full disclosure, click HERE. Friends, there’s a reason you don’t typically see much of my bathrooms. As much as I don’t care for them, a full renovation is totally out of the question, both in priority and funds. But, the space that has bothered me the most out of our bathrooms is the water closet within our master bathroom. 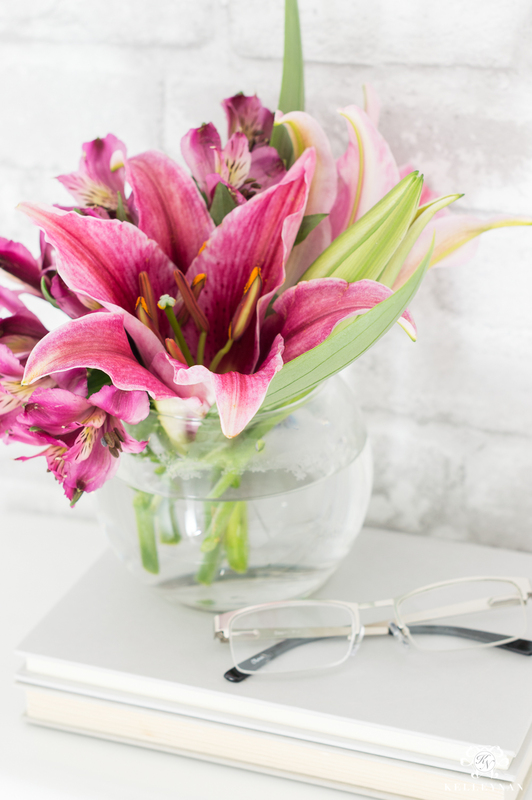 Well, I’ve talked about a surprise makeover reveal coming soon but have been tight lipped as to which space it was… I am so excited to finally share the DRASTIC transformation we were able to achieve in less than two days. You don’t hear much about toilet rooms – how they should look or their potential. Before, it was pretty typical- a dungeon-esque, bare room. With no natural light, the paint looks so dark and gloomy. Would you believe this is the same paint in our great room that looks so light and bright?! When I decided to take on the project, I considered a few things. 1. It had to be quick and relatively painless. Since I’ve been in the middle of a BIG master bedroom overhaul (reveal coming this Thursday! ), I didn’t want to take on something super labor intensive. 2. I wanted to make the most of this space and add some functionality. 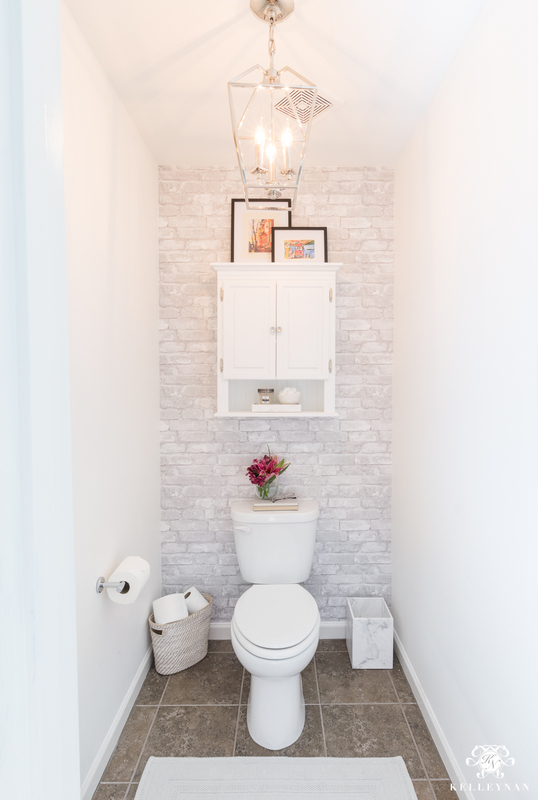 It is a smaller room (hello, it’s purpose is to hold a toilet) but it’s large enough to come up with some creative storage solutions and answer some of my other space challenges. 3. I wanted it to be “happier”, lighter, and brighter. The result? Y’all, I swear this has become Dave’s favorite room in the house! haha It looks crazy different but the changes were crazy simple. No ripping out tile, no grouting… just cosmetic enhancements and storage. I didn’t even have to order from multiple sources- Bed Bath & Beyond had everything down to the wallpaper and lighting (I had no idea they carried these kinds of things, much less furniture like full vanities). I also signed up for their new Beyond+ program; for $29, you get 20% off your entire purchase plus free shipping on every order. You can see more on signing up HERE. I loved having everything show up at my door but after it all arrived, I took a quick trip out to the store to make sure I hadn’t forgotten anything (and to look at the gadget wall- my favorite part of shopping at BB&B haha). They carry my favorite cleaning line (I’ve talked about this several times), so I picked up a few extra bottle of Hope’s. Next, Dave hung the lantern. Since I was going for light, bright, kind of loft-y modern, I wanted to stick to chrome fixtures and had an idea for hanging something a little more statement-y over the toilet. This lantern comes in multiple colors and sizes but the three-light guy turned out perfect. Dave even put it on a dimmer, which I especially like – ultra soft lighting in the middle of the night? Yes, please! The next part of the project was what I was most skeptical of but ended up being my favorite part. Because the room is so small, I wanted some sort of detail/accent wall. But, like I said, I wanted something quick, fairly painless, and it wasn’t in the budget to hire out for something crazy. I am loving this wallpaper revival trend but also don’t trust myself not to ruin expensive paper (and my walls). Having never applied wallpaper (I saw what it took for my wallpaper-er to hang the grasscloth just in my built-ins) I just didn’t want to do it. But, (again, I was shocked), in my browsing, I saw Bed Bath & Beyond had a selection of temporary, peel and stick wallpaper (see them all HERE). The description said it didn’t harm walls and you can remove when you’re finished. It’s super inexpensive so I thought, worst case scenario, if I get in the middle of it and decide I can’t do it, I’ll ditch it and pretend like it was never a possibility. I apprehensively decided to just go for it, using only a box cutter and a ruler (as my smoothing tool haha) and while it wasn’t the easiest thing I’ve ever done, it was actually pretty simple with patience. (Definitely pack your patient pants for this project! Lining up seams and hanging everything perfectly straight is not for the faint of heart 😉 ). This part of the project took the second longest; there are three drops on the back wall – I still have plenty left over after having ordered two rolls. As you can imagine, the corner (the last piece) and going around the toilet was the most difficult. With each piece, I had to excitedly take a picture and run downstairs to show Dave my progress. Y’all, I am so glad I decided to challenge myself a little because we love it. Actually, we love it so much, it was almost hard to hang the storage cabinet (one of the first pieces in the original plan) in fear it would cover too much of it. 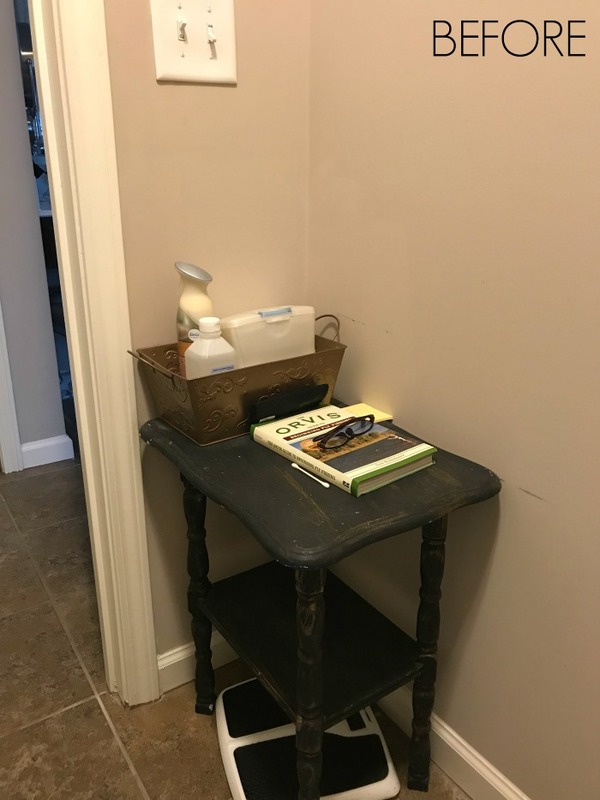 When I shared my bathroom organization projects (closet HERE), (cabinets and drawers HERE), I had a lot of questions about where I store my cleaning supplies. 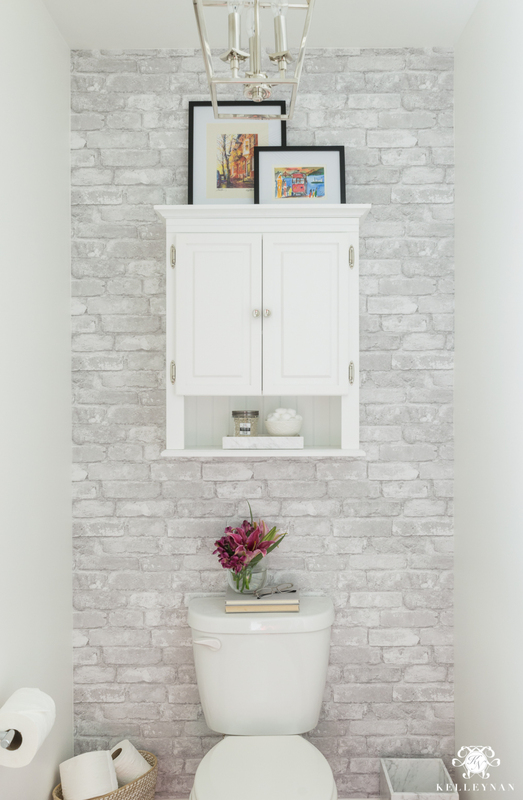 We are fortunate to have a lot of storage space, but, if you don’t or you are looking for other solutions aside from taking up that valuable real estate under the sink, the wall above the toilet in the toilet room offers the perfect place for extra storage. 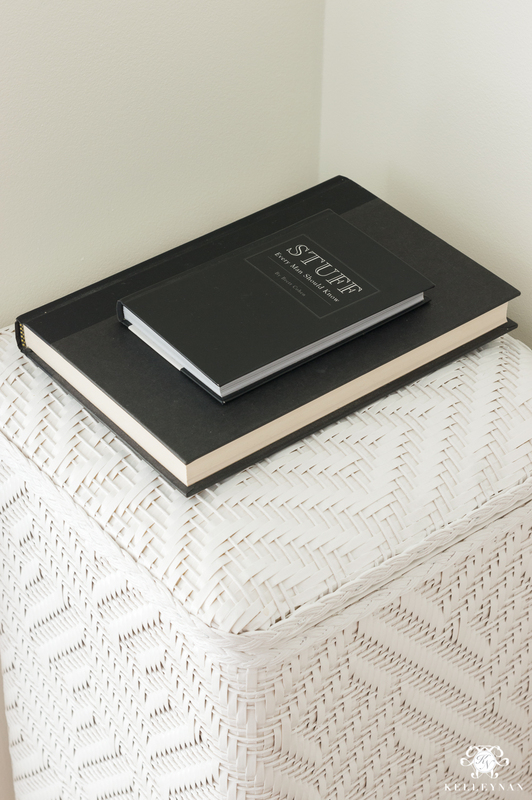 I usually use baskets as waste baskets but with my marble/loft-ish vibe, I thought I needed something a little more sleek- especially since I wanted to use this rattan basket for extra toilet paper. I decided to spring for the marble trash can. All of that was replaced with a storage hamper with a flat space on top for sitting magazines, books, etc. Thank you for sharing this! 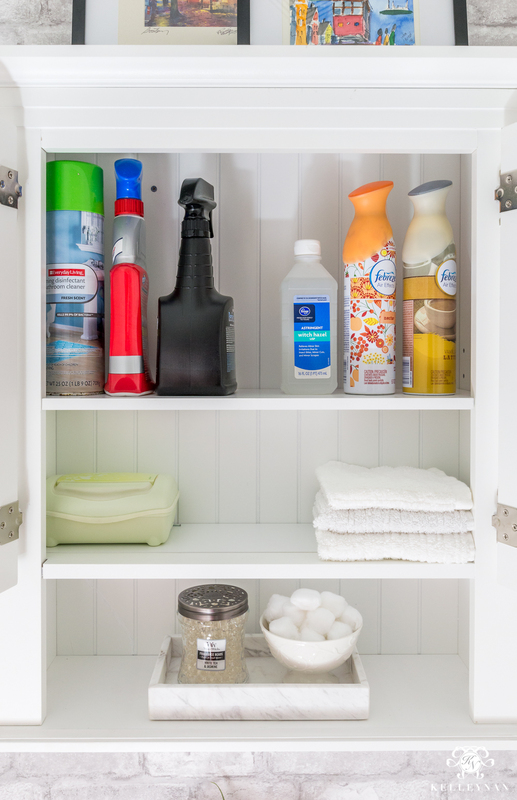 Your hamper idea to hide the bathroom tools might be just what I need! Looks amazing! I have similar plans for our toilet room eventually. Great job! Sara, thank you and that is awesome!! You will have to let me know how it turns out! Bree, honestly, I didn’t either! I am a new fan of that peel and stick wallpaper- what an easy difference it makes! Joan, that is so kind of you to say! Thank you! KELLEY!!! What a transformation! That wallpaper is fabulous! All of the details are! Love the plunger hidden! Genius! Tamara, thank you so much! Your new bathroom is so incredible swoonworthy! Kelley this is amazing!!!!! What a transformation I love everything but my favorite is the wallpaper 💓👍🏻💓. Oh & I am going to get the small hamper to hide stuff that’s genius. Kim, thank you!! I just knew I would give up before I started on the wallpaper but once I started, it was so much easier than I thought! So glad I tried or I never would have known! What great inspiration! Thanks for sharing these fab but practical ideas. I’m headed to BBB now. I have a room exactly like this, only I do have a window. This is the most amazing transformation ever! Love it and need to get to work on my own room! Everything is beautiful and makes me want to head straight to BBB! Thank you for finding this wallpaper! I wonder if it will adhere well to a painted furniture piece? We are moving into a newly built house in 2 weeks and I’m painting an old secretary desk navy for my daughter’s room and wanted to line the back shelves of it with a fresh, fun wallpaper. Oh thank you so much! I think it absolutely will. It is really sticky and vinyl-y but thin. On their site, they have furniture accents with the paper on them! Emily, thank you! Honestly, before I started tackling this project, I didn’t either. 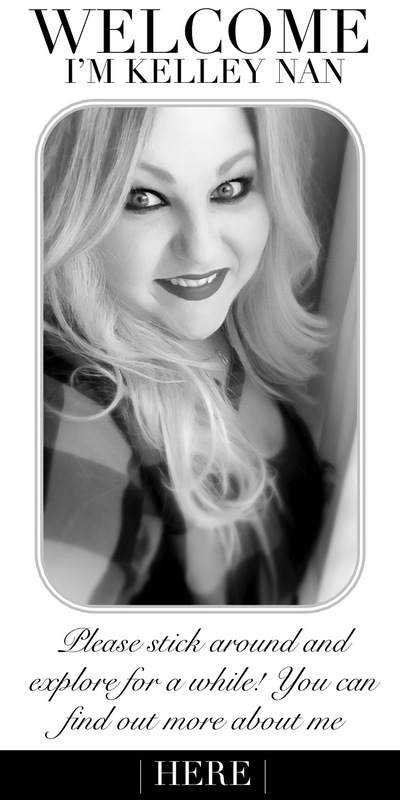 I am so so pleased with how it turned out! Erin, thank you!! I can’t tell you how thrilled I am to have a new pretty little space! Wow. It’s hard to believe it was transformed in only 48 hours. It looks ahhhmazing!! Lauren, thank you! Honestly, I can’t either but after the walls, the rest was a piece of cake! 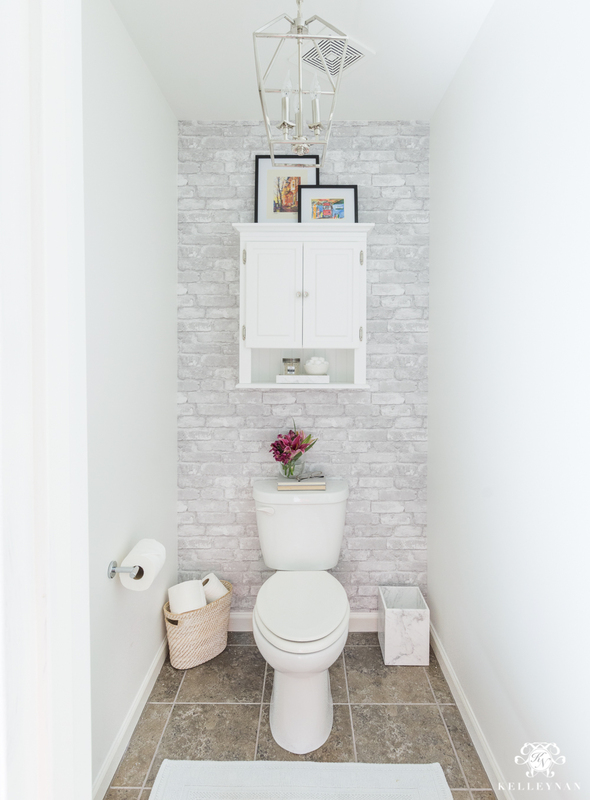 What a bright & beautiful little powder room Kelley! Love the accent wall & chandelier! Sarah, thank you so much! I almost backed out of the lantern but when I got it, was SO glad I ordered it! Kel, you nailed it! What a transformation! I’m so impressed and in love with it! 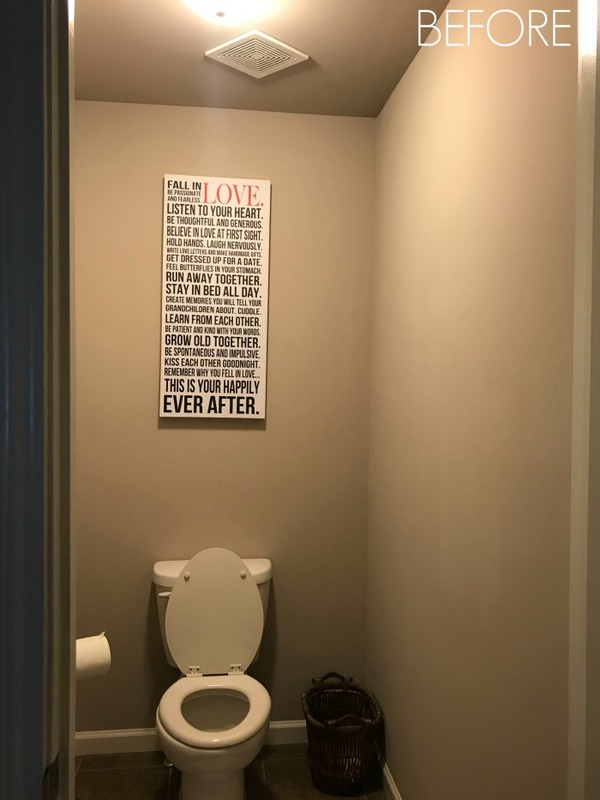 This definitely gives me motivation to tackle my own toilet area! Kelley this is an AMAZING transformation, especially considering how quick and easy it was! 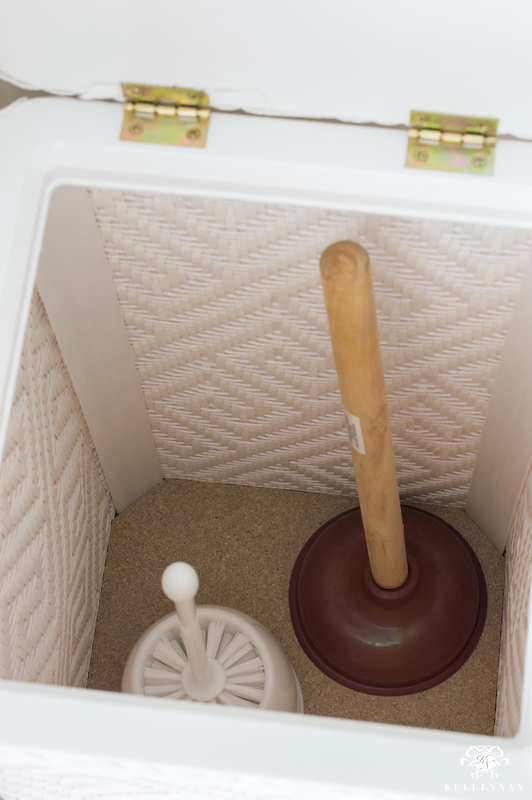 Love that hamper for the plunger – such a simple but brilliant solution! This looks amazing! I love all the details. So is there some dimension to the wallpaper? Does it look real in person? Thanks for sharing everything. Robin, it is flat vinyl but it TOTALLY looks textured. You almost have to rub it to see that it isn’t! It really looks amazing! 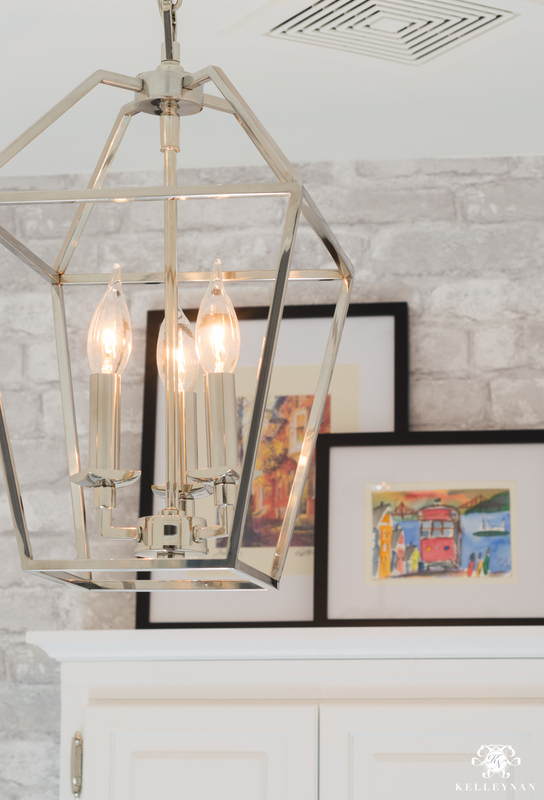 So light and bright and I love the new light – and that wallpaper. Genius idea on the plunger! Shelley, thank you! We are loving having this space! Tammy, yes!! 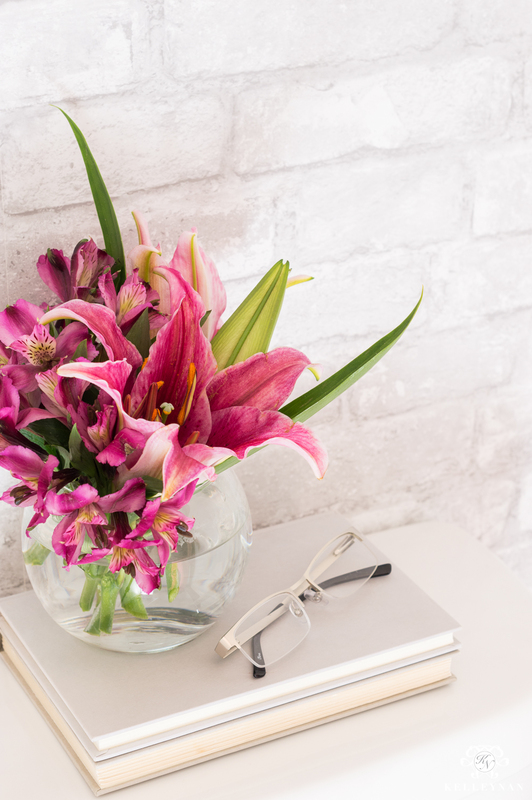 I was so happy to come up with a solution- I tried to think of everything from garden stools (to short) to a tall vase before I though “slim hamper!” and was able to find one! Kelley, it looks so GREAT! That wallpaper is beautiful! 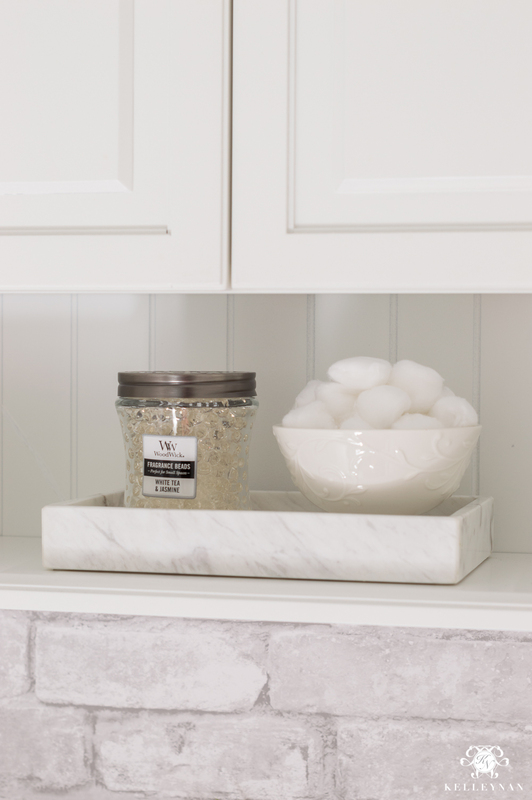 And love your hamper idea for the ugly parts of bathroom care and cleaning! Great job, can’t believe how quickly you pulled it all together! Thank you for sharing! This looks awesome. What color did you end up painting the walls? We’re on the hunt for the perfect white right now. Jennifer, I used the Simply White (BM) I had leftover from the bedroom. It was perfect!! Wow what a transformation! Love the floor to ceiling tile . Gorgeous Kelley! CC, thank you!! Peel and stick wallpaper! I love this!! A few tips will really help my area. We are actually pulling up carpet that had been put in our master bath by previous owners. Trying to find an inexpensive way to replace it. This gives me hope we might actually find a way!! 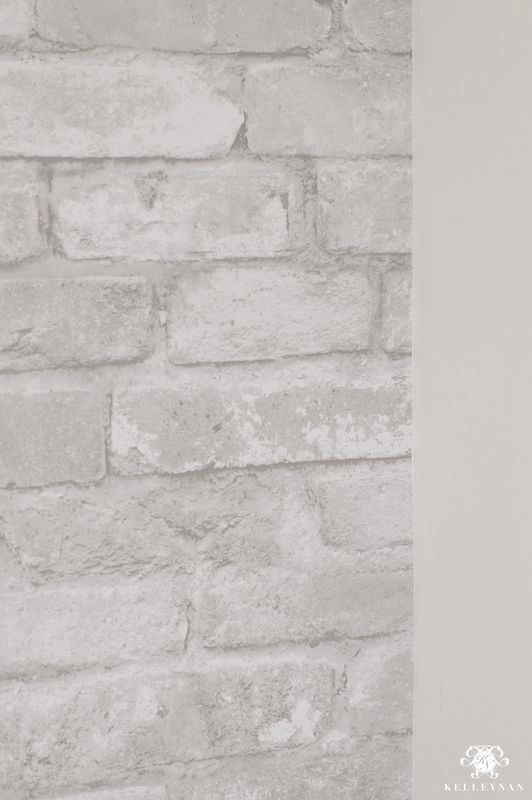 Paint and adhesive wallpaper will absolutely go a long way! Plus, updating your light fixture- good luck!! Kelly this transformation is spot on. You have thought of everything The “correct” name for the space you’ve re-created is the “water closet”. You Go Girl!! Donna, thank you! And so funny you bring that up- we literally had a “vote” on what to call it haha. Ultimately, “toilet room” won out for SEO and searchability. I think I do use “water closet” in there somewhere though. We are SO happy to have this space done! Just wondering if your still planning on doing a post regarding how you decorate your Christmas tree – especially the ribbon part? Because it’s getting kind of late in the year for it. Thank you for trusting us with your before photos- what an inspiration you have created! I want to paint our Ensuite and guest bath a white colour and now I’m pushing this to the top of the honey-do list! 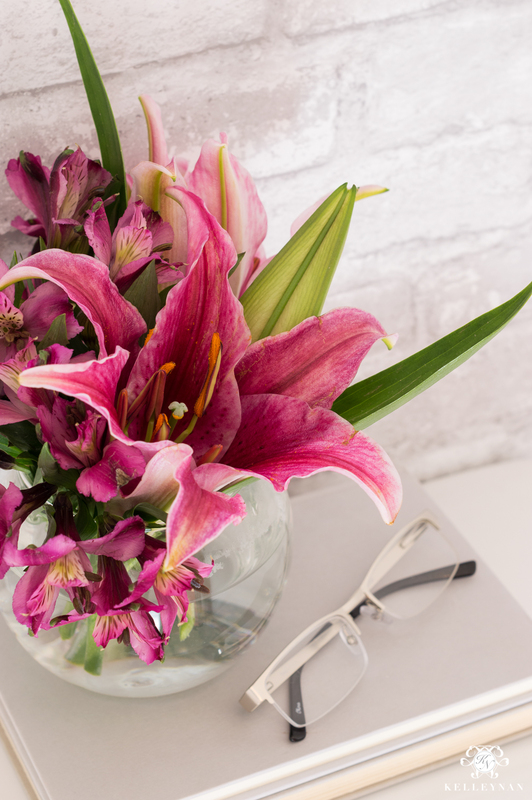 Love your little touches like the fresh flowers. Max, thank you so much! You absolutely should; it’s such a quick space that will make you feel so accomplished! Kelley, thank you thank you thank you. You might think you did this bathroom transformation for yourself but trust and believe that you did it for me. I have been cracking my brain on how to hide those brushes and the rest. Thank you again and again. Berny! I LOVE THAT! Then you are welcome haha! Seriously, thank YOU, Good luck on tackling your space! Kelley, I love you right back! And how exciting! 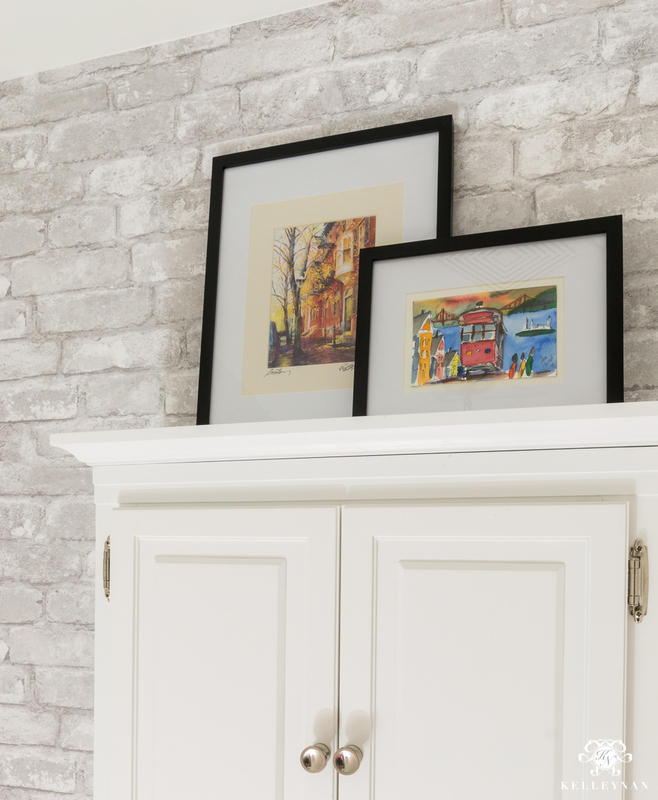 yes, think of all you can do to make it your own with removable wallpaper and a few updated light fixtures! Best of luck on this new fun journey, Kel!! Wow!!! What a great look you created in record speed. I love the light fixture and I never knew about the wallpaper at BB&B. Our water closet is very similar. Thanks for the inspiration! Great job! The bathroom looks beautiful!!! I love all the details. Is the rug light gray or white? Hi! Thank you so much- it is light gray. Thank you for detailing everything! What color paint did you use on the walls? Simply gorgeous! Hi, Bri! Thank you! It is Simply White by Benjamin Moore. I bookmarked this blog on instagram when you first posted it and I’m finally seeing it come to fruition! The best feeling! I’m curious though, what do the mirror in this space look like? I’m going back and forth on what I like! ahhh! Makes sense – didn’t even think of that!